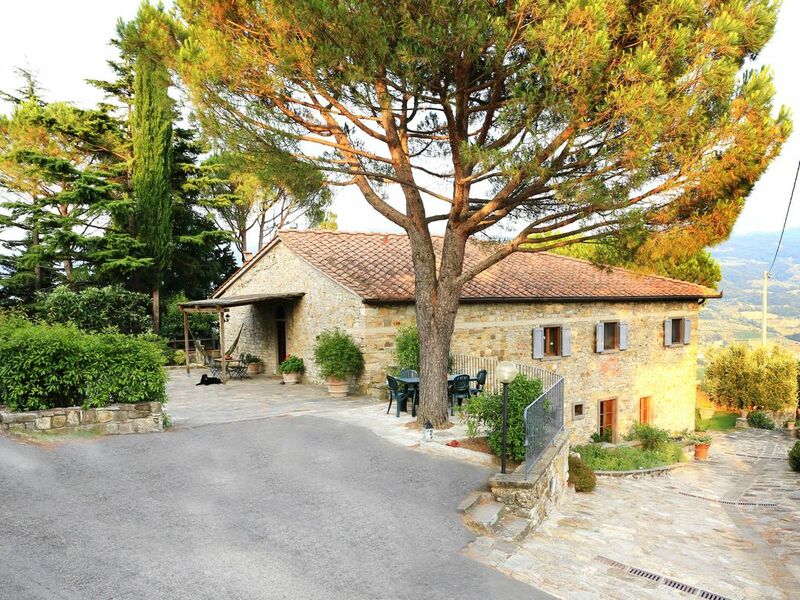 Comfortable family farmhouse, surrounded by a breathtaking view of vineyards and olive groves, but only 5 minutes from the village of Rufina (famous for its wine) and just half an hour from central Florence. Ideal for everyone from keen adventurers interested in seeing the sights of one of Europe's most famous cities to people seeking to escape the hustle and bustle of the city by enjoying a sweeping panorama view while relaxing with a glass of wine on the outdoor patio. The house has three spacious bedrooms, two with double beds, and one with 2 large single beds, comfortably sleeping 6 people, and an extra bed can be added. There are 2 brand new bathrooms, both with showers, and one with a bath tub. The kitchen is fully equipped with gas stove, oven, microwave, dishwasher, washing machine, American / Italian coffee machine, and also a very large fireplace (great for cooking on in the wintertime). The property is on one level so easy for people with mobility issues to get around. For larger groups (up to 7 people) there is also the possibility of renting our property where we live. Local attractions include wine tasting, horse riding, tennis, ceramic painting, golf, swimming, fishing, and world-class cuisine. NEW FOR AUTUMN 2017 / 2018 COME HUNT FOR TRUFFLES WITH A LOCAL EXPERT AND HIS DOG. AFTERWARDS WE WILL SHOW YOU HOW TO PREPARE THEM AND ENJOY THEM ON A PLATE OF PASTA!! Think Italy, think Tuscany and Florence. Well we have the farmhouse in the Tuscan hills, but we are just 25 kms (15 miles) from the city of Florence, so you get the best of both worlds. Step outside the door and you are in the garden with an incredible view over the vineyards and olive trees, and the village of Rufina at the bottom of the hill. There is a covered eating area with table, perfect for dinner outside on a hot summer's night with a refreshing glass of wine. So although the poor Florentines can't sleep for the heat you will find our place pleasantly cool and a pleasure to come home to after a day's sightseeing. Or take a dip in our above the ground swimming pool just by our olive grove, there are plenty of sun loungers. We harv fig, plum, apricot and cherry trees and a profusion of lavender, rosemary and thyme. My husband has just built a wonderful wood pizza oven as well as a barbeque in the garden. Please note it takes THREE hours to light and get the pizza oven to the right temperature! My husband and 4 sons are all wonderful cooks (one is currently working in a 3-start Michelin restaurant in Tokyo). So if you don't feel like cooking we can prepare you a delicious typical Tuscan meal (menu / price to be agreed upon). Or if you want to try your hand at making fresh pasta or pizza - (good fun for children!) we can also offer on-site cookery lessons. Help yourselves to fresh vegetables and fruit from our garden, or go visit our chickens and collect some fresh eggs. We have a cleaning lady who can come during the week, if you need her. If you book for more than one week we also include a mid-stay change of bed linen and cleaning. We have friendly Italian neighbours so we are not isolated but also we have our privacy. The village of Rufina (famous for it's wine) is just 5 minutes by car. Nearby we can arrange ceramic painting , cookery classes and if you really want to chill out we can arrange for a massage at home. Explore Mugello, still a relatively undiscovered area. The town of Vicchio is the birthplace of two of the greatest renaissance artists, Giotto and Beato Angelico. Head down towards Arezzo and visit the Franciscan Sanctuary of La Verna, where it is said that St. Francis of Assisi received the stigmata on 17th September 1224. Nearby is the Monastery of Camaldoli, founded in 1024, with it's old style pharmacy which is open to the public. I'm Suzy, originally from the UK, but I've been living in Florence for the past 30 years. I met my husband 30 years ago and never left! We bought this property and totally rennovated it, We have 4 lovely boys, a cat, dog and chickens and 200 olive trees, so plenty of wonderful organic olive oil. Comfortable family farmhouse. It has typical tuscan terra cotta floors in kitchen and parquet floors in the bedrooms. High ceilings with original beams, local tuscan furniture. Kitchen is well equipped with gas cooker, oven, fridge and microwave. Highly recommend staying here. You will never want to leave. Not only is the home lovely, but the hosts were so kind, helpful, friendly and made our stay even better. We hired Charlie to cook a scrumptious Italian dinner the night we arrived which was such a treat. Loved the nearby town and easy drive to train station to get to Florence. We are already trying to find time to return. We loved every minute at this home. Thank you to Suzy and Charlie for all your extra care and thoughtful holiday treats. We enjoyed everything and are so grateful to you both for all you did for us. Thank you! My husband, myself and another couple spent 5 days at this beautiful farmhouse. Our only complaint was that it wasn't long enough. Suzy made reservations for us for for wine tasting in a nearby castle, which was fabulous. Her husband, Salvatore, and son, Charlie taught us the art of pizza making and then served us dinner. It was an amazing experience in an amazing home in an amazing area of Italy. This was the highlight of our trip. Thank you for being so kind to us. Thank you for your lovely review. I'm glad you enjoyed your pizza making lesson, Salvatore is a great cook! kathleen d.Chicago, IL; New York; Washington D.C.
We've long dreamed of staying at a farm in Tuscany, and we were delighted to make this dream come true at Casa Bada. We loved the comfortable farmhouse and its environs, and we appreciated the hospitality of our hosts. Suzy was wonderful to communicate with, and we only wish we could have met her to thank her in person for all her recommendations, but she left us in good hands with her son Charlie and husband Salvatore. A highlight of the stay definitely was the first night, when we had arranged for Salvatore to prepare a dinner for us, which we enjoyed on their terrace, overlooking the amazing countryside. The garden was dying down and chickens not as active, but Charlie and Salvatore started us out with a good supply of fresh eggs and tomatoes, and they gave us a jar of Salvatore's excellent homemade tomato sauce, which we used one night when we cooked for ourselves. Their olive oil is delicious! We definitely would recommend hiking or driving up the hill to the windmill and its bodega and restaurant for a magical experience. One one recommendation would be to think about the country roads when selecting a rental car. We wished we had had a smaller car, with more clearance for those steep, winding, rutted Italian roads. This is an amazing property with all the luxuries of home. Almost every window has a picture perfect view of the countryside below. The spacious kitchen with welcoming 8 foot wide fireplace and antique family-friendly table is the perfect setting for meal after meal of home-cooked Tuscan delicacies. From candle next to the bathtub to the instant hot water kettle in the kitchen, living in this spacious apartment will feel as cozy as your own home. At the time of year we arrived, figs were falling off the trees and into our mouths. We went into Rufina for awesome pizza at il Ritrovo (the host called and made reservations for us), and we drove to Castello dI Trubbio for a private tour (again, great suggestion by our hosts) complete with wine tasting led by sommelier Noami. While we did not use the large swimming pool, it looked beautiful positioned high above the host’s 200 olive trees (you can buy a bottle from their private stock.) I could go on and on, but that is not necessary if you make Casa Badalamente your holiday home in Tuscany. Beautiful property and great owners! This property did not disappoint! The home is beautiful and comfortable, communication with the owner was great, and the views are gorgeous. This home is high up in the hills so just know that the roads to get there are narrow and bumpy, but once up there, you will love it. The town of Rufina is a cute little place. We had gelato at da i' Gela and pizza at the place next door. It was lovely in the evening to sit outside and eat and it is right next to a cute little park where the locals would sit on the benches and bring their kids to play. We really enjoyed the area. It is close to the train station and close enough for day trips to Pisa and Siena, which we did. It was also very convenient to Dicomano, which is where we were attending a wedding which was one of the main reasons I chose this property. The home itself is large and spacious so we didn't feel cramped with the four adults in our party. We cooked 2-3 times while here and I will say that the cookware should probably be replaced as it has seen better days. There are two bathrooms in this home, one with a shower only and the other with a shower/tub combination. The bathroom with the shower only is TINY. A large adult will have difficulty showering in it which is why all of us showered in the one bathroom with the shower/tub combo. I also found that the water took several minutes to warm up but then it would get too hot. The odd thing was that if you tried to turn it down just a tiny bit expecting to get cooler water, it would then just turn too cold, as in ice cold! There as no happy medium as far as the water temperature. I don't know why this happened. My only other complaint was that the WiFi was not the best so if you need a good WiFi connection because you need to get work done, be aware of this. While annoying, it isn't enough for me to not recommend this home as everything else makes up for minor inconveniences. Our host, Salvatore was super kind and friendly. He even invited us to have dinner with him one night where he prepared the most tasty spaghetti I have ever had! He prepared it using food straight from his garden. I've never tasted anything so fresh and delicious before! We were also welcomed with water, fresh tomatoes, and fresh eggs waiting in the refrigerator. We also arranged for him to cook us a several course meal, which was amazing. I have no problems recommending this lovely farmhouse. Thanks for writing a review and I'm glad you enjoyed your stay with us. Salvatore is an amazing cook so I'm glad you had a chance to sample his cooking. I'm sorry to hear about the issues that arose. As you know we live on the property so we know that if a problem arises guests can come and knock on our door. The plumber has been to sort out the water temperature problem. The shower room is a regular European sized shower, whereas as the bathroom is more spacious. We have also taken note of the frying pans, the saucepans are in perfectly good condition. Wifi in the countryside is not as fast as you are used to back in North America, but has worked quite adequately up until now. Old Tuscan farm houses with thick stone walls are never going to be up to speed. Beautiful view of Tuscany right in the middle of Chianti. 5 minutes down the road is the village of Rufina , one of the famous Chianti regions (famous for it's wine). There you will find everything you need, grocery shops, supermarket, weekly market and a good choice of restaurants and pizzerias. There are local tennis courts and stables. Wine tasting can be arranged in one of the local vineyards. There are also several public swimming pools nearby. There is a fishing lake 2 minutes away with a good pizzeria where you can fish until midnight in the summer. Explore the countryside, watch out for wild boars, deer, porcupines and pheasants, some of our local inhabitants. Take the local train into Florence and save yourself the hassle of parking. It's a 30 minute ride and takes you right into the centre of town. Apart from Florence we are well placed for day trips to Pisa, Siena and Arezzo, just to name a few places. There are also local places of interest to visit nearby. Price includes electricity, gas, water and final cleaning. Heating (when required) is not included. A deposit of 30% required.